This week, Google started turning on by default, Google+ profile to Gmail inbox messaging - even if the Google+ user doesn't know your Gmail account email address. You Gmail account will be impacted by the change when you receive an email from Google stating that the feature has been turned on. "Ever wanted to email someone you know, but haven't yet exchanged email addresses? Starting this week, when you're composing a new email, Gmail will suggest your Google+ connections as recipients, even if you haven't exchanged email addresses yet." To turn off the feature, log into your Gmail account. From there, click the "gear" icon near the top right of the Gmail window. Select the "Settings" menu item. Scroll down the list of settings until you see "Email via Google+". To completely turn off the feature, set it to "No one". If you choose to leave the feature on, but with some limits, any email being sent to you via Google+ will, for now at least, appear in the "Social" tab in Gmail. 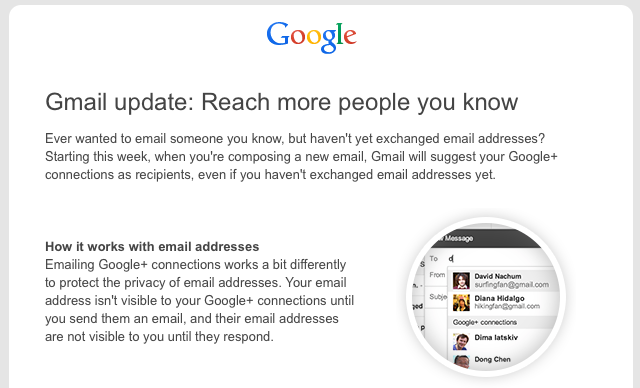 I'm sure Google will be able to meet it's goal of integrating Google+ with Gmail - they really haven't left us a chance with the opt-out setting and many people who don't read this or other great technology blogs will completely miss this change. For me, though, this is getting to be a bit much. Google's motto used to be "Don't be evil" and I started using Google's services back when that was clear. Now, with Google well into their advertising business, I'm less sure "Don't be evil" gets enough air play.